The Vow is a dark paranormal fantasy novel written by Laura Daleo. Claire Mathews was puzzled at not seeing her dad waiting for her at the airport. He was always very careful to be on time for any family activity. She grew even more confused and a bit alarmed when her attempts to call her parents or her brother, JJ, met with no success. Finally, she loaded her bags into a waiting taxi and made her own way home. Her driver took a second look at her when he arrived at her destination, as if to make sure she had it right. Claire was stunned to see the police tape festooning the front of her parents’ home. The police cars and the Medical Examiner’s van she saw turned her surprise into dread. Detective Reynolds was sent over to see her, and she met his questions with barely disguised impatience. Yes, she was a student, and home for the summer holidays -- but where were her parents and brother? 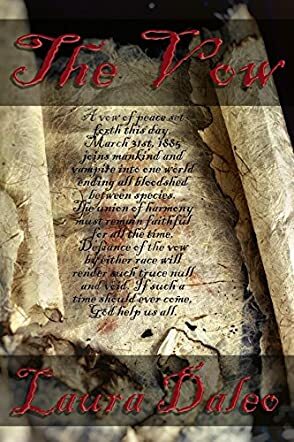 Laura Daleo’s dark paranormal fantasy novel, The Vow, is set in a world where vampires and humans live peacefully under the conditions set forth by The Vow. I’ll confess to being a bit jaded by urban fantasies featuring vampires, but found Daleo’s offering to be a most agreeable change from the standard fare. Her plot is precisely drawn and apt to please anyone who enjoys not only fantasy, but also well-written police procedural mysteries, and her characters are engaging and credible. Who killed Claire’s parents and what happened to JJ? Claire’s reactions to her sudden loss are the stuff that makes psychological thrillers tick, and her quest for answers and justice kept me hooked into this decidedly different vampire fantasy. Daleo’s insights into the vampire psyche are profound, and those characters in her book of the vampiric persuasion are especially worth spending some time with. The Vow is most highly recommended.